We have been using the Certified Reconditioned Standard Programs machine for a few months now and absolutely love the machine. After using a Vitamix, the one thing you always need to do is to clean your Vitamix. We are reminded daily how easy it is to clean such a powerful machine. The detailed Vitamix cleaning instructions are described below, but it literally takes soap and warm water to clean. Could it get any easier than this? Below are the official Vitamix cleaning directions along with a Vitamix cleaning video that demonstrates how easy it is to clean a Vitamix. After each use, rinse the container thoroughly with warm water—not hot. Secure the lid with the lid plug in the locked position. Select the Clean setting and start the machine. Your machine will automatically turn off when the cycle is complete. Pour contents out and rinse thoroughly. Turn the container upside down and let air dry. Start the machine on Variable Speed 1, slowly increase to Variable Speed 10, and then switch to High. Run on High for 30-60 seconds. Place 4 cups of cool water and 4 cups of white vinegar into the container and let it soak for about four hours. Then follow the appropriate cleaning instructions above. There are other alternative methods that can be found on the web, but we suggest following the guidelines suggested by Vitamix, as they have the most experience and knowledge of their machines. How do you go about cleaning your machine? 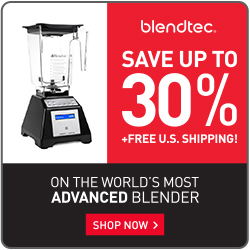 Do you have any other blender cleaning methods that work well? Let us know!